One of the favorite terms I have heard during my years as a venture capitalist is when investors refer to “unbounded opportunities” as they describe what they are looking for in potential new investments. Makes total sense. The corollary is to find opportunities that intersect large markets that are churning or in transition of new markets that are growing rapidly. Intellectually this all makes sense but ultimately the concept of “big” or “unbounded” has to be translated to reality and distilled to an operating that can then be executed against to produce results. As I have gotten involved with different companies one of the exercises I try to go through is to think about how the company might be able to map it’s business or value proposition on to a 3 dimensional graph. By doing so it also helps the company focus on what the key business drivers are, and in turn the metrics that should be used to measure both performance and success. If the company can clearly define the opportunity and growth that is possible across three dimensions then the multiplicative effect brings in to clear focus how big an opportunity is at hand. How one defines the XYZ axis depends on the business and value proposition. I have included a simple example below to make the point. This could be a company that is focused on selling a software SasS solution to the enterprise. One dimension could be the total accounts one could address or capture. 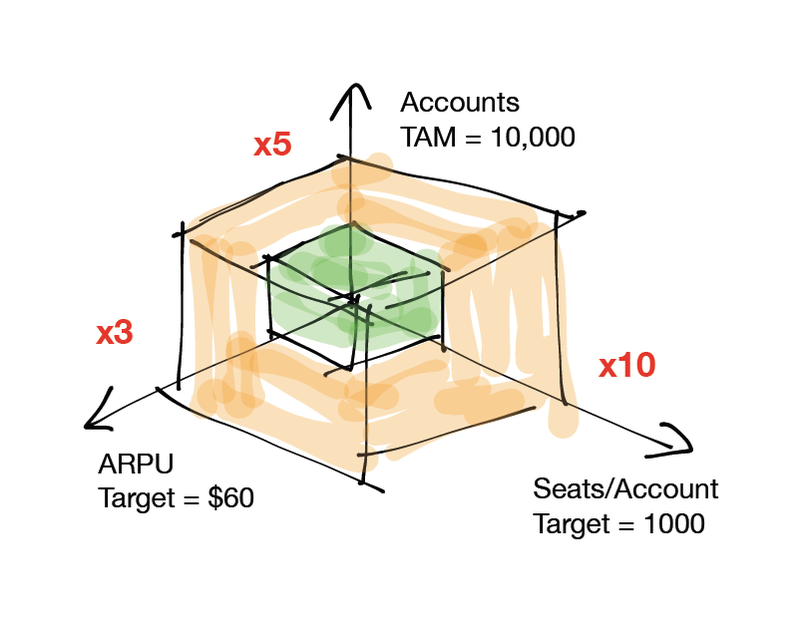 The other dimension could be the number of seats per account, and finally the amount sold per seat (ARPU). Increasing the number of accounts is obvious: double the accounts, double the revenue, but if initially the average number of seats per account is 100 and the total potential by penetrating the entire account is an average of 1000 seats, that is a 10x growth potential in revenue. Likewise if the initial monthly revenue per user is $20 but there is an opportunity to up sell these to $60, that is another 3x upside. This also helps set a pretty clear direction on where marketing and sales resources should be invested in order to maximize the multiplicative effect of 3D growth. In the above example if your company has 2000 accounts with an average of 100 seats paying $20/month, you have a monthly run rate of $4M. If you did nothing but increase to your full ARPU potential and account penetration you would have a 30x growth in your business or $120M/month. Go from 2000 to 10,000 and you have another 5x for a total of 150x. I know this is a bit of an exaggeration since 100% of TAM is not reality, but it helps make the point of the leverage that comes from being able to think about the business growth in three dimensions. Not all businesses can be mapped onto 3 dimensions, but it is worth trying to find as close a model to this as possible, because with it will come clarity about what you need to do to scale your company successfully and make that “unbounded opportunity” a reality.